For this long Easter weekend, we decided to stay home and do some Spring clean-up in and around the house. We’re not really fond of it but it’s something that has to be done. 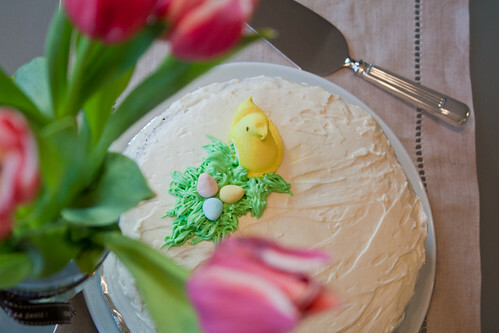 But before we started plowing through these chores in the house, we decided to make a cake for Easter since we haven’t made any in a long time. 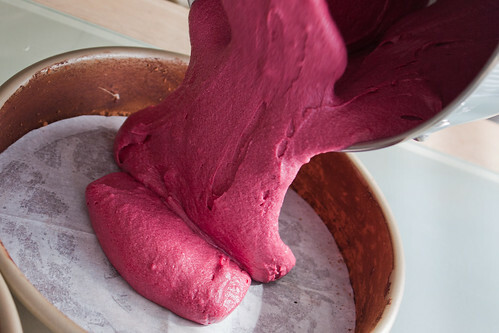 After going through some cookbooks, we found a recipe that we’ve always wanted to try, Red Velvet Cake with Cream Cheese Frosting. This is perhaps our second favourite cake, next to Chocolate Blackout Cake which we’ve made in the past. The recipe of course was from our favourite cookbook, America’s Test Kitchen. However, this particular recipe has been featured in their show Cook’s Country from the episode Historical Cakes. I guess we just kept coming back to this cookbook since after all, the recipes have been tried and tested. Not that it’s a guarantee and makes it foolproof (as we’ve discovered in the past with some recipes) but it does give us some sense of security. I’m sure one of these days we’ll eventually veer off to other cookbooks and get out of our comfort zone. 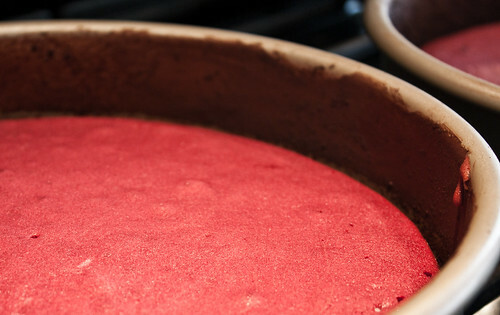 Here are some of the key steps in making this delectable cake. 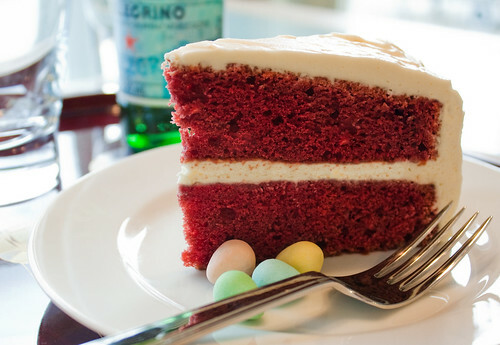 The cake is so tender,velvety and moist. 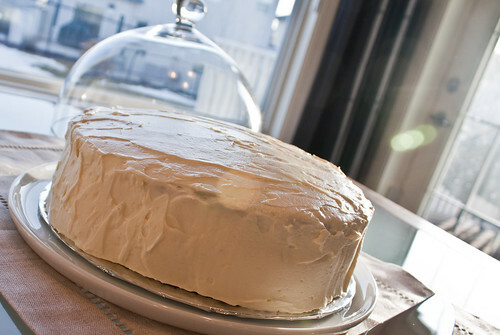 And of course, covering it in fluffy cream cheese frosting just elevates it to the next level! Note: Use natural cocoa powder so the cake would have proper rise and colour; do not substitute with Dutch-processed cocoa. For the cake: Adjust oven rack to middle position and heat oven to 350 degrees. Grease and flour two 9-inch cake pans. Whisk flour, baking soda, and salt in medium bowl. Whisk buttermilk, vinegar, vanilla, and eggs in large measuring cup. 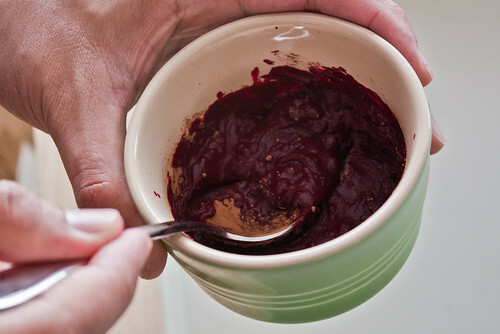 Mix cocoa with food coloring in small bowl until a smooth paste forms. With electric mixer on medium-high speed, beat butter and sugar together until fluffy, about 2 minutes, scraping down bowl as necessary. Add one-third of flour mixture and beat on medium-low speed until just incorporated, about 30 seconds. Add half of buttermilk mixture and beat on low speed until combined, about 30 seconds. Scrape down bowl as necessary and repeat with half of remaining flour mixture, remaining buttermilk mixture, and finally remaining flour mixture. Scrape down bowl, add cocoa mixture, and beat on medium speed until completely incorporated, about 30 seconds. Using rubber spatula, give batter final stir. Scrape into prepared pans and bake until toothpick inserted in center comes out clean, about 25 minutes. Cool cakes in pans 10 minutes then turn out onto rack to cool completely, at least 30 minutes. 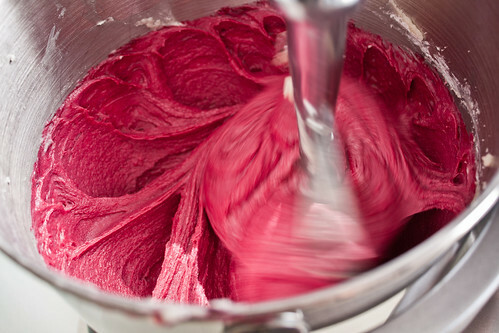 For the frosting: With electric mixer, beat butter and sugar on medium-high speed until fluffy, about 2 minutes. Add cream cheese, one piece at a time, and beat until incorporated, about 30 seconds. Beat in vanilla and salt. Refrigerate until ready to use. 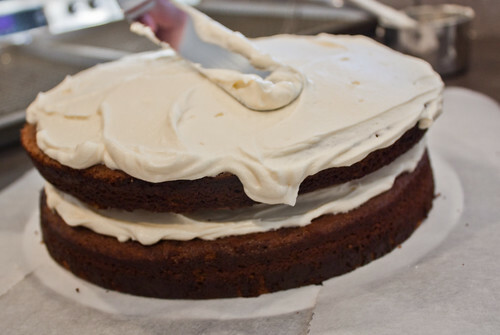 When cakes are cooled, spread about 2 cups frosting on one cake layer. Top with second cake layer and spread top and sides of cake with remaining frosting. Cover and refrigerate until ready to serve, up to 3 days. This entry was posted in Events, Food & Drink and tagged cake, dessert, Easter. Bookmark the permalink. Post a comment or leave a trackback: Trackback URL. Your cake is beautiful like all your creations! You know how much I love sweets…it’s killing me to look at such a yummy cake and not being able to eat it. You’re pretty lucky that you live so close to all those wonderful bakeries and cake shops. I love sweets too but I gotta start watching my figure. Ha! I made the cake again today for my daughter Carla’s birthday. It looks even nicer than the first one I made. I will get Deb to send you a picture. Hi Patty! We made this recipe again but as cupcakes and they turned out well. I really love this cake. You can send me the pic through my e-mail address here — ernie@ernskie.com. I’d love to see it since Deb tells me you make wonderful desserts.